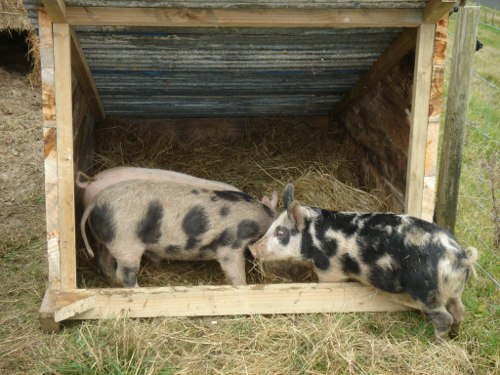 Our weaner pigs have been growing pretty quickly so it was time for them to have some more permanent accommodation. 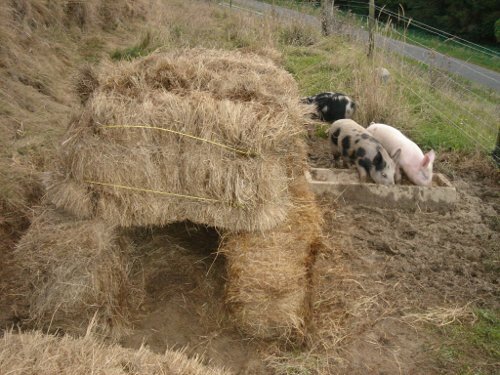 Their first house was this hastily built hay bale house. It worked out really well with great insulation and it was very easy to build and expand. All we needed was some old bales of hay (courtesy of Nick and Louise down the road) and some baling twine for reinforcement. When they started knocking it down (and without the help of a big bad wolf) I made them this house of…not sticks, but close…wood. 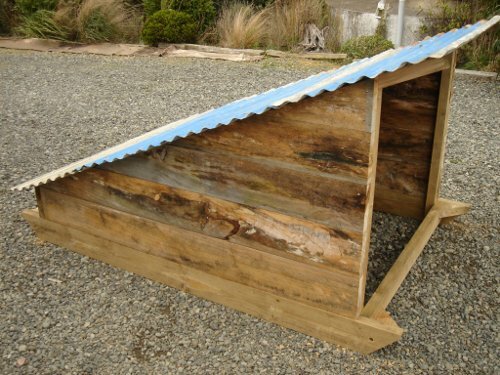 It’s a really simple design – just a lean-to on skids with a roof. We can tow it around with the quad bike as we move the pigs around their woodland enclosure. Best of all, I used left over timber from the stables fit-out and some old tin lying around, making it a zero cost project. Here are the wee porkers exploring their new home. Judging by the effort required to rouse them in the morning, I’d say they were pretty happy with it. Mate, where is the floor? When it all turns to mud your pigs will not have a dry bed. My similarly built pig houses have a fitted timber floor to keep the pigs off the ground. Would the pigs get cold if a cold draft came in? I’m getting my piglets in April and I’m afraid that the pigs will get too cold. We put straw down in the house if it gets cold or wet out, and always face the front out of the prevailing wind. They will bunch up for warmth most of the time and we haven’t seen any problems with this shelter. It depends on your local climate too as to how much more protection they’ll need – you could build a front on this sort of shelter with a doorway for them to come and go if you wanted. What size is your pig house? I am getting 3 pigs this spring.